I want to share with you my progress so far, but then I want to wait until it's all done which is silly, because knowing myself, it will never be done. I will always come home and decide that it's time to switch something up, or that suddenly I can't bear to look at a piece of furniture any longer. At the end of the day, I have to remind myself that I am just one person, and that I AM making progress. So - today, here are some "so far" updates. New sofa! It was a long and hard search, but I finally sold my old sofa, and found one that I absolutely love. The design to me is classic and can be paired with a range of different styles so it will stand the test of time (and my changing tastes!). It's simple and neutral in color so I can play up accents, extremely comfortable, and upholstered in a breathable cotton/linen blend that's washable. The best part? I found it on Craigslist, brand new, for less than half the retail price. YES! I hung my curtains - unfortunately my apartment doesn't get a ton of natural light, so I went for thin white cotton that would still provide privacy and let light get in while covering those god awful vertical blinds every Los Angeles apartment seems to come with. 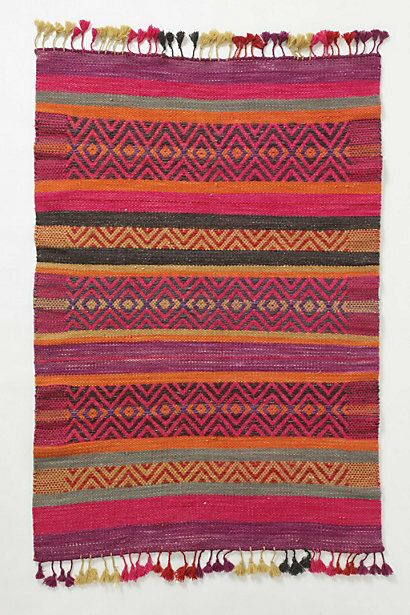 A rug for the bedroom that I got on sale at Anthropologie. Storage for the bathroom - I got this piece to house all my hair stuff, back up toiletries, etc. for $20 at this weird cash only sale at Urban Outfitters. I think I may want to paint it a fun bright color to bring a little life into the bathroom but I'm just not there yet. Necklace solution. It's the jewelry conundrum; is there ever a good way to store your jewelry? I have so much of it, and I like to be able to see it all. Previously I used a bamboo key hook, but that disappeared in the move and also wasn't ample storage. I wound up going with these teensy tiny 3m clear hooks with teensy tiny clear adhesive strips and tacked up one for each necklace, about 45. What I really want to do is put up my deer skull and hang my necklaces off of that, but I'm having a hard time figuring out how to do that. A TV! I haven't had one in a very long time, and while I don't have cable I can watch lots and lots of netflix and movies. Still thinking about how I'd like to camouflage it a bit more, maybe hang artwork around it? New dining chairs. 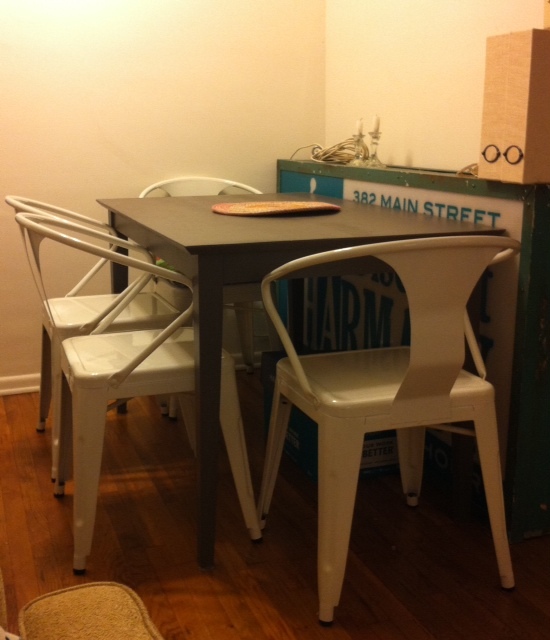 Wanting some seat cushions, and still trying to sell my old table and get something that fits the space a little better. So there's my 'so far' for you. There's still a lot to be done, and still a lot I want to change, but it's progress! What do you think? I'm really digging your sofa and the anthropologie rug. What brand is your sofa? I'm on the hunt for one as well at the moment, as we just moved and are starting fresh. :) Yay for making a place your own with a budget! Thanks so much! My sofa is Sofa U Love, http://www.sofaulove.com/sofa-u-love-made-in-usa-upholstered-pasadena-build-a-sofa.htm, but I actually scored it off Craigslist brand new for far less than retail. It's a great sofa and super comfy though! I totally understand your frustration with decorating your own space. We tend to build a vivid image of how we want our own place to look like from a very young age, only to find out that we’ll probably never get it to look exactly the way we want it to. Still, I think you did an amazing job! I love that sofa, and that rug is awesome!